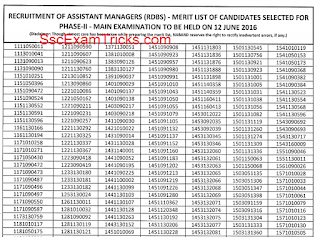 NABARD AM Main Admit Card 2016 Released – Download Nabard Assistant Manager Interview Call Letter 2016 on www.nabard.org. NABARD full form ‘National Bank for Agriculture and Rural Development’ is under process for uploading Assistant Manager Main (Phase II) Admit card by online mode at website www.nabard.org. The Nabard AM Main Admit card is expected to be available in the last week of May 2016. The NABARD Bank main exam (Phase II) is planned to be held tentatively on 12th June 2016 at various centres across the country for a total of 700 vacant posts of Assistant Managers (Grade ‘A’ ) in Rural Development Banking Service (RDBS), Assistant Managers (Grade ‘A’ ) in Rajbhasha Service, Assistant Managers (Grade ‘A’ ) in Legal Service (Legal), Assistant Managers (Grade ‘A’ ) in Protocol and Security Service and Managers (Grade ‘B’ ) in Rural Development Banking Service (RDBS). Earlier NABARD bank had released Assistant Manager preliminary exam result on 25th May 2016 on official website www.nabard.org. The pre exam was held on 15th May 2016. 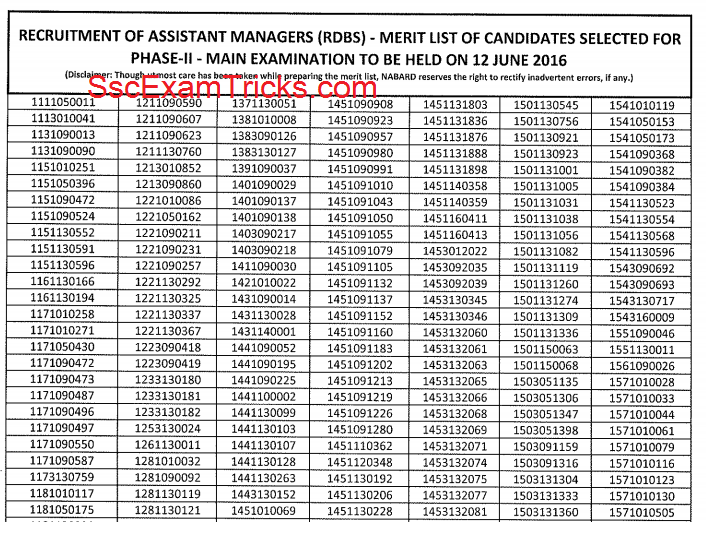 The latest news is that NABARD has released roll number wise list of shortlisted candidates called for the Phase - II Main examination. Those candidates who had qualified in pre-exam and now waiting for NABARD Main Admit card 2016, they can download their online Admit card for Main exam from the direct link provided in the end of the posts. · Name of Posts – Assistant Managers (Grade ‘A’ ) in Rural Development Banking Service (RDBS), Assistant Managers (Grade ‘A’ ) in Rajbhasha Service, Assistant Managers (Grade ‘A’ ) in Legal Service (Legal), Assistant Managers (Grade ‘A’ ) in Protocol and Security Service and Managers (Grade ‘B’ ) in Rural Development Banking Service (RDBS). The NABARD Recruitment final selection will be based on their performance in Main (Phase-II) Examination and interview. The Main Exam has been scheduled to be organized on 12th June 2016. Earlier Nabard Pre exam was conducted on 15th May 2016 by online mode in both Morning and Evening Session. The question paper was composed of a total of 200 marks in which 200 multiple choice questions was provided from various sections i.e. Reasoning (50 Questions of 50 Marks), English (30 Questions of 30 Marks), Quantitative Aptitude (50 Questions of 50 Marks), General Awareness (40 Questions of 40 Marks) and Computer Knowledge (30 Questions of 30 Marks). The time duration for pre exam was 2 hours i.e. 120 minutes. Each correct answer added one mark in the final marks. There was a penalty of ¼ marks for each wrong answer. Nabard Assistant Manager Main Admit Card 2016: The Nabard Main exam will be held on 12th June 2016. The Phase II (Main Examination) will be consisted of two papers i.e. Paper I & Paper II. Nabard AM Paper-I (Descriptive) will be common for AM (RDBS), AM (Rajbhasha), AM (Legal) and Manager (RDBS) posts. Paper I will consist of General English, analytical and drafting ability of the candidate shall be assessed from the Descriptive English paper through essay writing, comprehension, report writing, paragraph writing & Letter writing. The paper will have descriptive questions carrying 100 marks. Nabard AM Paper-II will be set in bilingual language i.e. Hindi and English and will be of 3 hours. The shortlisted candidates will be called for personal interview. NABARD AM Interview call letter will be released on official website at www.nabard.org. It is mandatory for the candidates to bring Interview Letter to the venue of interview. Candidates must produce NABARD Bank Interview letter at entrance of the interview hall. A candidate fails to produce interview letter at the time of interview will not attend interview. NABARD Bank Interview will be conducted in two steps. It will be conducted for 15 Marks. · Printout of the valid Nabard AM Interview Call Letter 2016. Nabard AM Interview Questions (Expected): Nabard bank question may be asked as ‘Tell me about yourself’, ‘Why do you want to join this job’, ‘What do you think about job responsibilities of AM’ etc. There may be some questions to be asked from Family Background, situational, decision based and conditional questions. One of the easiest processes to download NABARD AM Main Admit card has been discussed here. The following steps are given by which you can get your online main exam admit card within a few seconds or minutes. First, click on www.nabard.org. Go to the career link given at the bottom on official page. Check direct link to be appeared as ‘NABARD AM Main Admit card 2016’. Enter your registration number and date of birth. Click on login button. Your Nabard Assistant Manager Main Admit card will be downloaded. Open it and check your as well as your father name spelling. Take a printout on paper. Don’t forget to bring your Nabard AM Main Admit card in main exam. Few Steps for Downloading NABARD AM Interview Call Letter 2016: The process to download interview letter is quite simple and discussed here in effective way. The steps which are discussed above must be followed.